Digital world, digital x-rays. Why are they better? Not only are they faster, and provide better image quality than traditional, they are also safer and better for the environment. Digital x-rays expose you to 80 percent less radiation than traditional radiography. Digital x-rays are more environmentally-friendly than traditional x-rays because they rely on digital computer uploads for viewing instead of chemical development. Less chemical produced, means less chemicals in our planet! 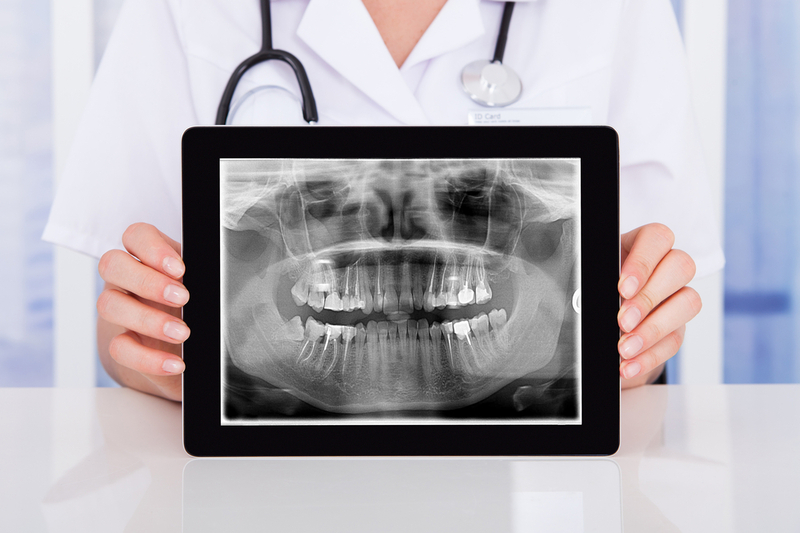 Digital x-rays save storage space and also provide Dr. Hardy with a better tool for diagnosing and treating you. Unlike traditional x-rays, digital x-rays can be enlarged, transposed, and highlighted to better show what is going on in your mouth! One of the great advantages of digital dental x-rays is that they have the ability to take multiple intra-oral x-rays in minimal time with far less radiation exposure than conventional radiography–up to 85 percent less radiation exposure to be exact. Conventional radiography systems are unable to provide you with these results. You are not only limited to the number of images you can gather during a radiography session, but you are exposed to the radiation levels for longer periods of time. Digital oral x-rays are taken using a small sensor which records the image of your teeth and transmits it to our computer. The computer is then able to broadcast a highly-detailed image of your mouth, teeth and tissues. This digital image can be enhanced, enlarged, sharpened, colorized, or displayed as a negative to more accurately diagnose dental conditions you may have and to help Dr. Hardy determine the precise treatment you need. These high-tech capabilities are impossible with conventional film x-rays. In an age where we are ever trying to reduce, recycle and reuse, digital x-rays allow us to store your dental images electronically in your own electronic patient file that can be called up and consulted at any time without taking up more space or wasting paper. Chemicals that were needed in the past to process conventional x-rays are eliminated in the process also helping the environment and reducing waste. X-rays also help your doctors better gauge your progress during treatment because they can be superimposed with images taken earlier to visually compare the progress/changes during your treatment. With this powerful, new tech, you and your doctors can monitor: tooth movement, bone loss or growth, bite changes and decay. Digital x-rays involve you more in your treatment and supports what we do for you. Like we referred to earlier, digital x-rays help our environment by eliminating the need for toxic x-ray fixers. According to the Eco Dentistry Association, every year, dental practices generate 28 million liters of toxic x-ray fixer. Conventional x-ray fixers contain chemicals such as Ammonium Thiocyanate and Boric Anhydride–which can be extremely hazardous if inhaled or ingested. Our efforts to go digital protect our environment from the negative effects that harsh chemicals can have on it helping to make it a better, healthier place for us all. Surprisingly, even with the knowledge we have about the dangers that conventional x-rays can have on our environment (and on ourselves) only 25% have switched to using digital technology. Belmar Orthodontics is dedicated to progress and offering our patients products and methods they can rely on. One of the other great advantages of digital x-rays is their ability to take multiple images at once, and then display them instantly. We know you have places to be and things to do. The last thing you need is to spend valuable time having x-rays taken, waiting for them to be developed, and then waiting for them to be analyzed.